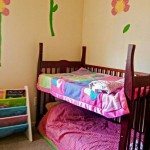 Turn an old crib into a toddler bed | DIY projects for everyone! 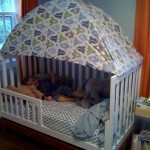 Here’s a clever way to maximise the use of your child’s crib/cot as he or she transitions from being a baby to a toddler! Instead of giving away or selling that cot (or before converting it into a totally different kind of furniture piece), you can turn it into a toddler bed. It’s easy to do – in fact, you may just have to turn it upside down – and it’s way less costly than getting a brand new bed for your youngster. And of course, it’s a bit of fun for everyone! Good idea? You can get more ideas on cribs turned toddler beds by viewing our album below! Do you know someone who could use this idea?